RadioIndy created a CD Announcement Press Release for The Shells on Digg.com! RadioIndy is pleased to announced that we have published our CD Review of The Shells music to CD Baby. FANS - Please checkout The Shells online! FANS - Please checkout R Scott page and sample / purchase some great new music! Radioindy is pleased to announce that we have published our CD Review for R Scott to YouTube.com. RadioIndy is pleased to announced that we have published a music playlist and CD Review with R Scott music (and similiar Big-Name Artists) to their Rhapsody artist page. FANS - Please checkout R Scott iTunes page play / purchase some great new music! Radioindy has published R Scott CD Review to lala Music Online. FANS - Please checkout R Scott la la and play / purchase some great new music! Tune in to KUCI 88.9 FM or www.kuci.org Monday 11/9.I'll be in studio talking about my current release Mad Forms & Twisted Poses. Maybe playing some tunes too. The show airs 1 - 4 pm. I'll be wandering in about 1:30 pm. 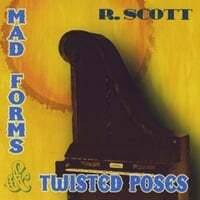 "Mad Forms & Twisted Poses" Reviewed by RadioIndy.com!